Lissa Bryan: Enter to Win a Kindle Paperwhite! Enter to Win a Kindle Paperwhite! Authors T.M. Franklin and Sydney Logan love Christmas! To celebrate the season, they are giving away three awesome prize packs to get you in the holiday spirit! 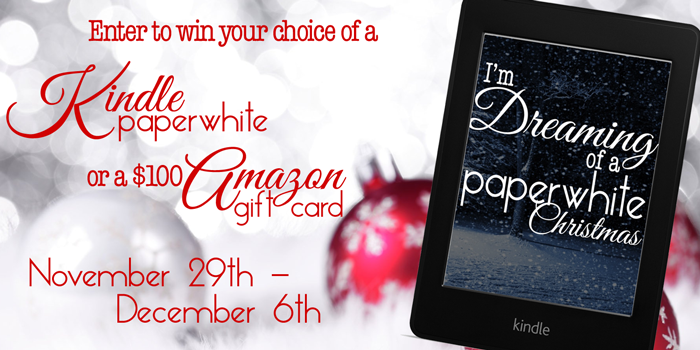 *Grand Prize - Kindle Paperwhite (US only) OR a $100 Amazon Gift Card (Open Internationally). Prize includes 30+ classic Christmas stories that will be delivered to your Kindle. *2nd Prize - (3) winners will be chosen to win a Kindle copy of "The Little Drummer Boy" by Sydney Logan. *3rd Prize - (3) winners will be chosen to win a Kindle copy of "Window" by T.M. Franklin. The Rafflecopter is below. Good luck! My favorite holiday movie is "It's a Wonderful Life". My favorite Christmas movie is Scrooged with Bill Murray. My favorite song is The Drummer Boy with Bing Crosby and David Bowie. My favorite Christmas movie is Rudolph the Red Nose Reindeer. My favorite Christmas song is Noel. I prefer to celebrate the solstice…all the shopping drives me crazy. I've always liked the original Frosty the Snowman cartoon. It makes me cry but so does Puff the Magic Dragon. Thank you for the giveaway!! Merry Christmas!!! P.S. My favorite Christmas movie is Ebby, with Susan Lucci.